AIM LOW: Black tries posthumously to resuscitate his high school reputation by bonding with Marsden in this indie comedy. The D Train, which premiered at the Sundance Film Festival last January, is a good idea in search of a better movie — specifically, a better script. It falls into the category often called "comedy of discomfort"; fans of HBO's "Enlightened" won't be at all surprised to spot Mike White in the cast (he also coproduced). The hallmark of this satirical subgenre is that it produces more cringes than laughs — and at that task, The D Train succeeds admirably. But, unlike "Enlightened," The D Train doesn't have a compelling central character or much in the way of scathing insight into the human talent for self-delusion. First-time directors Andrew Mogel and Jarrad Paul (who cowrote the comedy Yes Man) built the film around a bold concept, but after that they seem to have suffered a failure of inspiration. 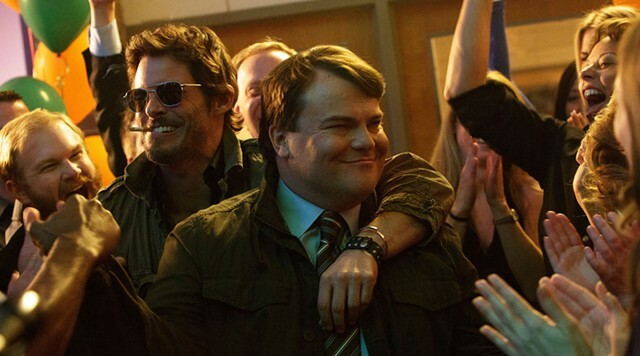 Jack Black plays Dan Landsman, a schlubby Pittsburgh consultant whose life is so empty (in his own mind, anyway) that he's obsessed with making a grand appearance at his high school's 20th reunion. Never mind that he has a supportive wife (Kathryn Hahn), a polite, articulate teenage son (Russell Posner) and a new baby. Dan only has eyes for the coolest dude in his graduating class, Oliver Lawless (James Marsden), whose abs he just spotted in a tacky national TV ad campaign. If only he can persuade this Hollywood hot shot to come home for their reunion, Dan imagines, maybe he'll finally be cool. So Dan concocts a ridiculous plan (and, as the script later acknowledges, a needless one) that permits him to go to LA "on business." There he meets up with Oliver, who struggles to remember Dan from high school but cottons to his toadying flattery. The viewer sees that Oliver is Hollywood small fry with a movie-star smile; Dan doesn't. Buoyed by mutual delusion, the two go out on the town and get wasted, leading to a pivotal scene that shifts the balance of power between them. That scene is probably the only reason The D Train will be remembered in a year's time. Suffice it to say here that what might have been the catalyst for a tense, provocative third act is instead the setup for a long letdown. After Oliver makes his triumphant return to Pittsburgh and bunks down at Dan's home, the film wobbles through a series of lukewarm jokes — and one incomparably uncomfortable reunion scene — to its conclusion. The D Train touches on ugly truths about the indignities people will suffer to move up a spot in a senseless social hierarchy, be that Hollywood or high school. Its greatest flaw is that it sees its characters as superficially as they see themselves. Oliver has little depth beyond the initial revelation that he's fronting, while Dan embodies the sitcom archetype of a would-be class clown deprived of the appreciative audience he craves. Steve Carell's Michael Scott is the obvious template for this character. But while we felt the depth of Michael's desperation to be liked, Dan remains opaque, as if Mogel and Paul simply stamped "loser" on his forehead, wound him up and let him go. In Bernie, Black played against type and made an off-putting character oddly likable. Here, closer to his manic wheelhouse, he never succeeds in making us care about Dan's frenetic quest for status. The film's best moments belong to Jeffrey Tambor as Dan's behind-the-times boss, whose gentle bemusement puts the whole thing in perspective. Discomfort comedy highlights human pettiness, but to work as satire, it can't let us feel too superior to its small-minded characters. The D Train inspires pity for its principals, but not a lot of sympathy or self-reflection in its audience — and even less laughter. Cringe comedy isn't so bracing when we're cringing for its makers. The D Train is not showing in any theaters in the area.